I love this story! I would not have eaten that weird looking egg though. Actually, who am I kidding…for a chance at a double-yolk I definitely would have been standing right there next to Eoin. Though I may have had to seperate out one of the yolks before eating it – I am an adult afterall! You would have fought Eoin for the egg! By the way, we have duck eggs in the refrigerator too – and these I bought at the grocery store! I would have nabbed that half dozen just for the oddly shaped egg in a heartbeat, Janet. One oddball it would be for an oddball egg. What a wonderful story. 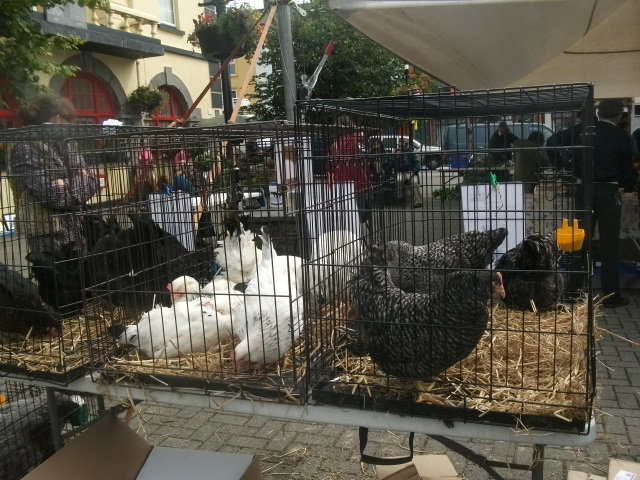 I probably don’t have to tell you how much I would like a market like Kilrush. I really like your photos, especially with a chance to see your blue pottery. If we hadn’t already had dinner, I would be tempted to make an Irish breakfast supper tonight. I do remember you writing about it, Janet. It is so nice to see it settled in and being used. I love kitchen scenes such as yours, with your misshapen egg and traveling butter dish. Now I don’t think he’ll be satisfied in life until he gets to see a double-yolk egg! A great story, beautifully told.Your posts are making me bring forward a trip to see my brother in Clogheen, Co.Tipperary…..and making me wonder why I leave so long between visits. J. Thank you Janice! Make haste to Tipperary – the weather appears to be improving! Enjoyed the suspense waiting for the egg to be cracked open. Being free range, I thought the outcome might be the remains of an unhatched chick inside but thankfully it was nothing traumatic. That happened to my mother when she was a little girl and she never again ate an egg. 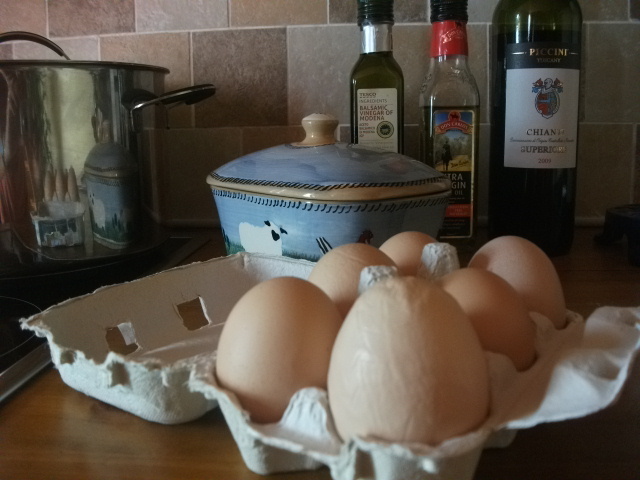 I’ve only seen a double yolked egg twice in my life so while hopefully Eoin will encounter one at some stage, I don’t think upping his intake will increase his chances. Nice to see a vegetarian mom would cook even a ‘partial Irish’ for her son though. Patricia, that is exactly what I was afraid of with that egg! If there had been an unhatched chick in it I would have had an egg cracking phobia for the rest of my life! All this boy wants to eat is eggs, sausage, white pudding, chicken goujons and cheeseburgers… I have to force him to take bites of my “potato and veg’ sides or a taste of my vegetable soup. And he’s the one I was going to raise vegetarian!